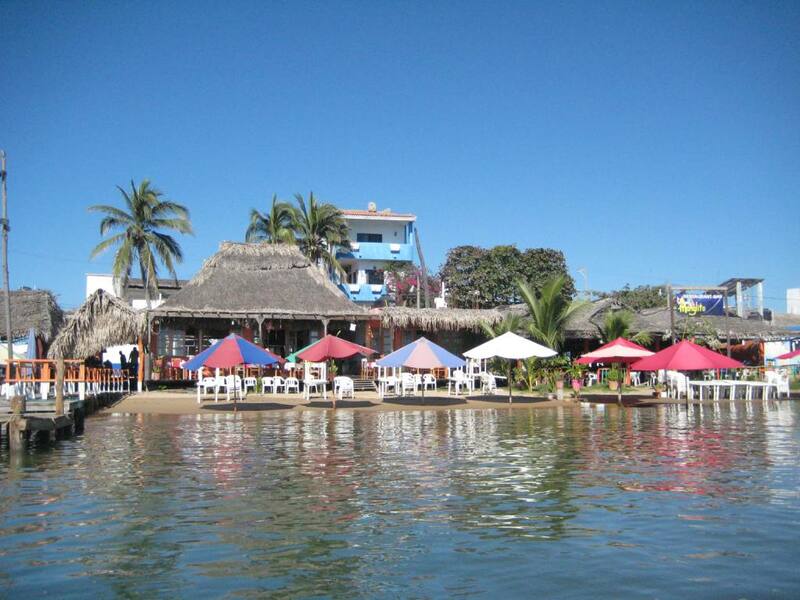 We decided, along with Hugh and Annie, to ride the two miles to Barra De Navidad for a thorough, all-day long excursion. By 10 in the morning we’re happily zooming in our dinghy, safe in the knowledge that at destination we’ll find a dinghy dock (no landings, hurrah!). 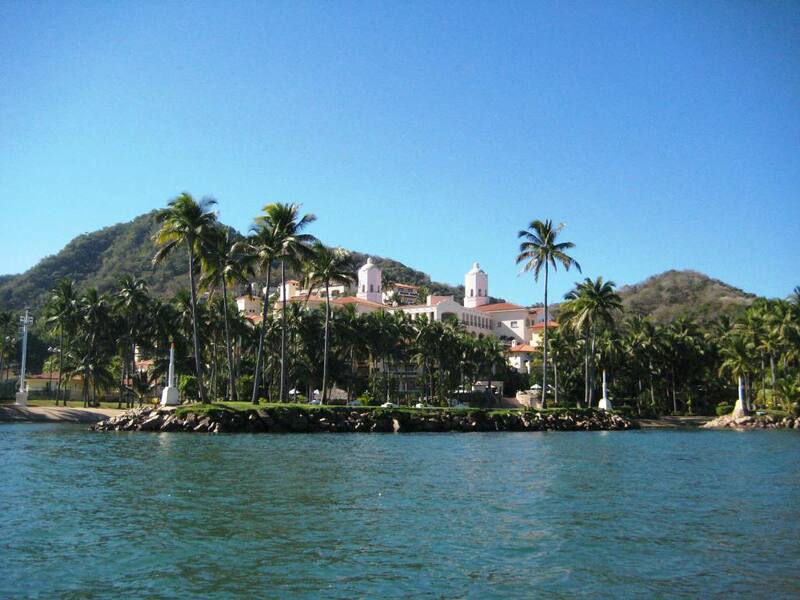 The entrance to the Barra lagoon is gorgeous, there’s a meandering street lined with palm trees that goes to the Grand Hotel, a luxurious, imposing building overlooking the bay. It is rumored that a room here costs $500 a night. I love my boat, which affords us the same views at a much lesser price… But I’m still drooling over their many pools… Anyway, after a customary tour and subsequent approval of the anchorage (we’ll return here on our way back!) 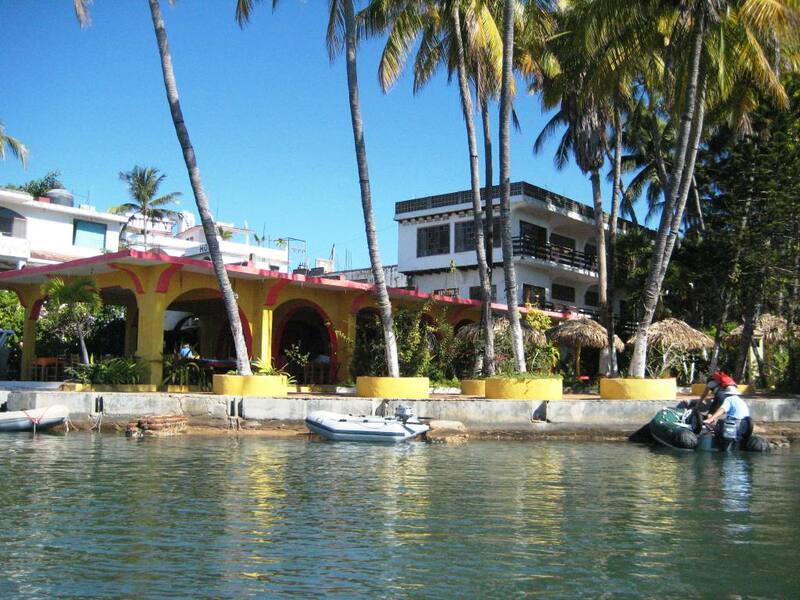 we reach our destination and tie up our dinghies right in front of a lesser but cute hotel called Sands. We have a tasty and filling breakfast here, before starting a long walk which will reveal the beauty of Barra. It is a very tourist-y place. 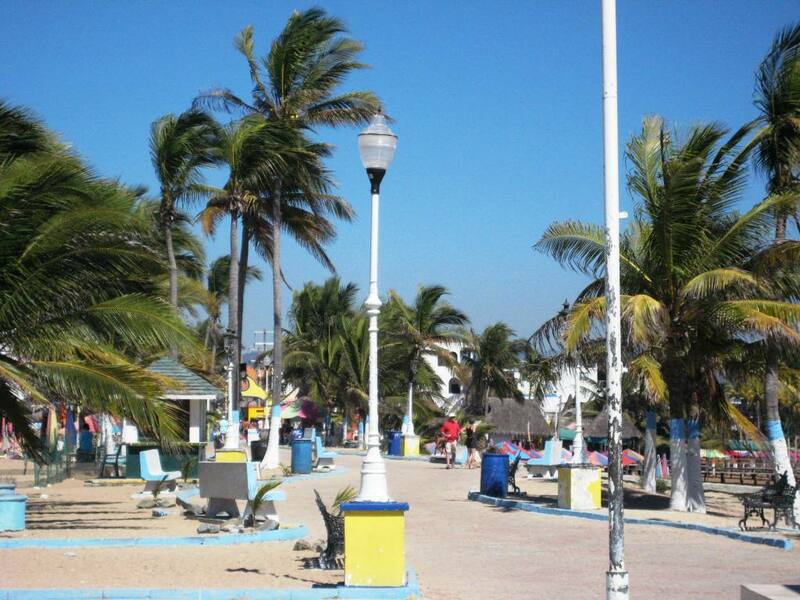 The streets are lined with tiny shops selling souvenirs, colorful tablecloths, rugs, clothing, hats, shells, etc. It’s a feast for the eyes! Even I, notoriously averse to shopping, find pleasure stopping in the shops and talking to the owners. Nobody here is pushy; I’m free to look, browse, touch and marvel, and even without buying anything I always get a smile and a greeting. 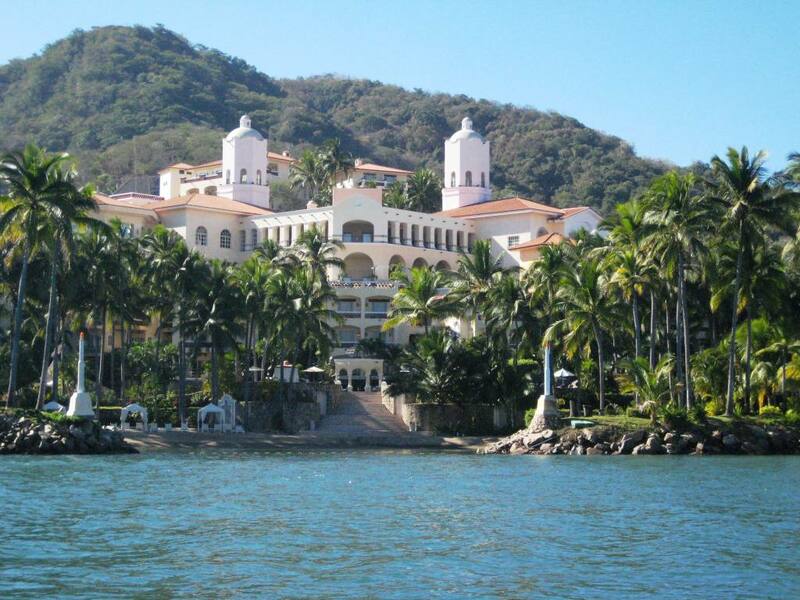 There’s a myriad of restaurants, many perched on the beach with incredible views of the bay. There’s also the Laundry shop, the Bakery, the Barber. As luck will have it, today is also Crafts Market Day. Lots of vendors here are selling paintings, jewelry, wood carvings, textiles, ceramic artifacts and more. I’m sweating like a turkey on Thanksgiving, my face is shiny with perspiration but I don’t even flinch, I’m so busy taking it all in happily! About six hours go by in a blink, I don’t know how. It’s time to get some refreshments, so we make our way back to the Sands Hotel where we meet more cruisers we know. With a cold drink in hand we exchange information, news and suggestions, parting with the promise to keep in touch. Impossible not to, as we pretty much travel in the same direction and always end up bumping into each other! As we retrieve our dinghies for the trip back to the boats, the tide is low, the wind has picked up and the waves are choppy, so we have to pay extra attention to where we navigate. We anticipate a slow and wet trip… Sadly, not even 10 minutes from departure, Hugh & Annie’s outboard engine quits working and doesn’t want to be resuscitated. We quickly grab their line and tie it to our dinghy, we’ll be towing them home. This is why it’s good to buddy-boat! It is a slow trip, alright! And a thoroughly soaking experience, too! We all get slapped by waves, the effect is a shower-like experience. Thankfully, the water is warm and the air is not yet chilly. Every time we get blasted, we laugh like kids. I can’t see anything, hair plastered against my face and sunglasses sprayed by salt water. I hope Tom can find the way back… It’s a long ride, about 20 minutes of the same wet thing, but we make it back safe and sound, none the worse for wear. I find out that sea water is really slimy and I’m slippery like a buttered eel, whatever I touch slips away, my feet don’t grip. As soon as we’re back to the boat I dive into the shower hollering “now I know why fish are so slippery!”. We’re pretty tired but happy for all we experienced, tonight is a movie, cookies and milk night. I know sleep will come easy! 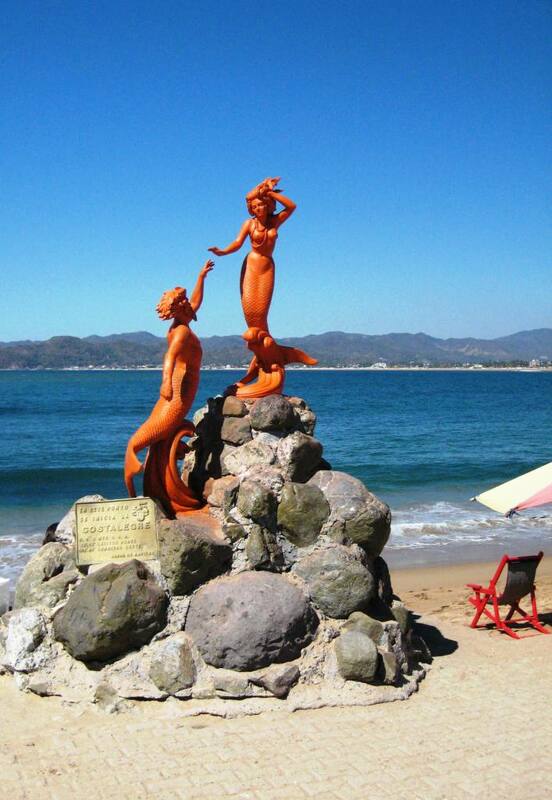 Which is good, since tomorrow we’re leaving early for the next port of call, Las Hadas in Bahia Manzanillo. 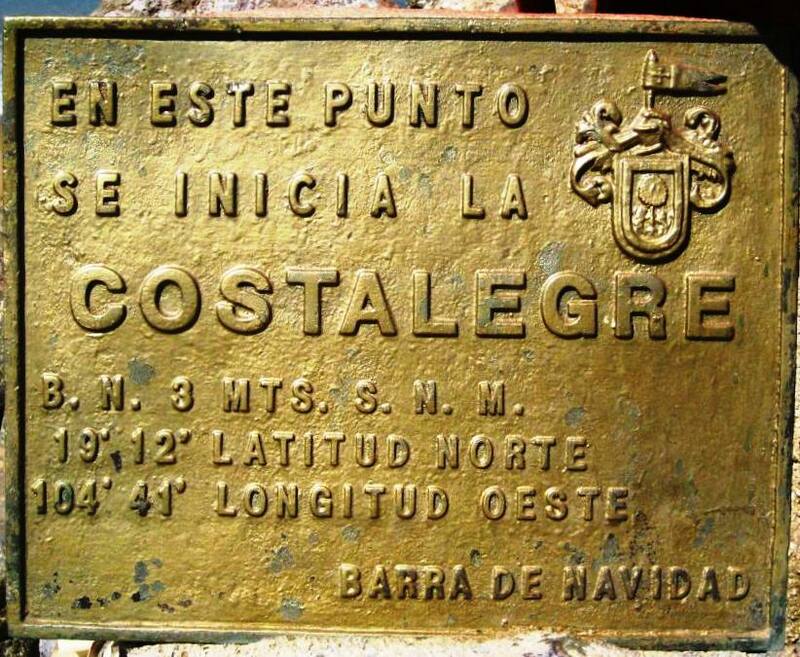 One noteworthy particular: from Barra de Navidad on and proceeding south, the coast is now appropriately called Costalegre –Happy Coast. I believe it was the Costa Dorada – Golden Coast we sailed so far. After my email yesterday with a concern as to where you were, I logged on and found about 8 new postings on this site. Glad to here that you are doing good and having fun. What ham net and freq are you on now and what time? Would like to make a contact.